On hearing or taking a glance at the result of this South of Scotland Cup clash, you would be well entitled to think that it had been something of a one sided affair. This however was not the case for Hawick United from the Border Amateur ‘B’ division more than matched ‘A’ league outfit West Barns Star despite what the score line says. United indeed had the edge for long periods of the match. But thanks to making the most of the scoring chances that fell their way, it was the Star who shone in getting a win at the end of the day. On a park with a slippery, greasy surface Hawick almost opened the scoring in the second minute through a Kevin Strathdee free kick that shaved the upright. United maintained their enterprising start and West Barns keeper Jordan Thorburn was called into action in pulling off a fine save from Kevin Strathdee. Home number one Dean Fry then thwarted the Star in keeping out a Neil Anderson effort. 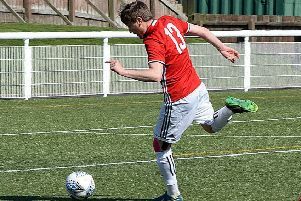 Despite the heavy underfoot going play continued at a lively pace and Ross Scott after denting the West Barns defence by working his way inside from the left, fired in a shot that the diving Thorburn did well to push out. In the 26th minute the visitors edged ahead. Ross Wallace rolled a pass back to the feet of Fry, the keeper booted a clearance against the crushing Clark Smith and the ball cannoned off the West Barns attacked and into the net. West Barns joy was short lived for within three minutes Hawick grabbed an equaliser. Defender David Strathdee getting his name on the score sheet with a perfectly taken penalty after Scott had been downed by a Joseph Finlay challenge. No more goals arrived during the first half. United set the pace at the beginning of the second period with some enterprising raids. Just past the hour mark however the Teries were sent reeling when West Barns scored against the run of the play when Smith polished off a thrusting solo run by shooting home. Throwing caution to the wind United began to go all out for an equaliser and West Barns had their backs against the wall. The Star soaked up anything that came their way however and in the 83rd minute went further ahead through a breakaway goal from Kevin Skelton. In the closing seconds Skelton notched a fourth.